Sometimes I feel like we have the same side dishes for all our meals. We have rice or potatoes or pasta plus a veggie or just a veggie. I try to mix it up but sometimes I just run out of ideas or I don’t feel like putting the effort into making an elaborate side. During the summer it is a little bit easier because there are a lot of fresh veggie sides you can whip up pretty easily and of course there’s potatoes…which are great for grilling. However, after making potatoes numerous different ways I was really thinking about making something different. I love cheesy scalloped potatoes, but who wants to heat up the oven when it is 100 degrees outside!? So I decided to make scalloped potato foil packets to cook on the grill and much to my delight they came out pretty darn good. Foil packets of any kind are great especially if you are only cooking for two…it is also a really good way to practice good portion control. It is best to make individual sized packets…you may be tempted to make one big packet or put a few servings in one packet, but trust me…it will be easier to handle, the food will cook through better and it will just make your life a lot easier. The recipe below makes two foil packets, the measurements are suggestions, you can definitely increase or decrease the cheese to your taste or use whatever cheese you like best. Using a mandolin, slice potatoes to about 1/8” thick. Cut two squares of foil and spray with nonstick cooking spray. 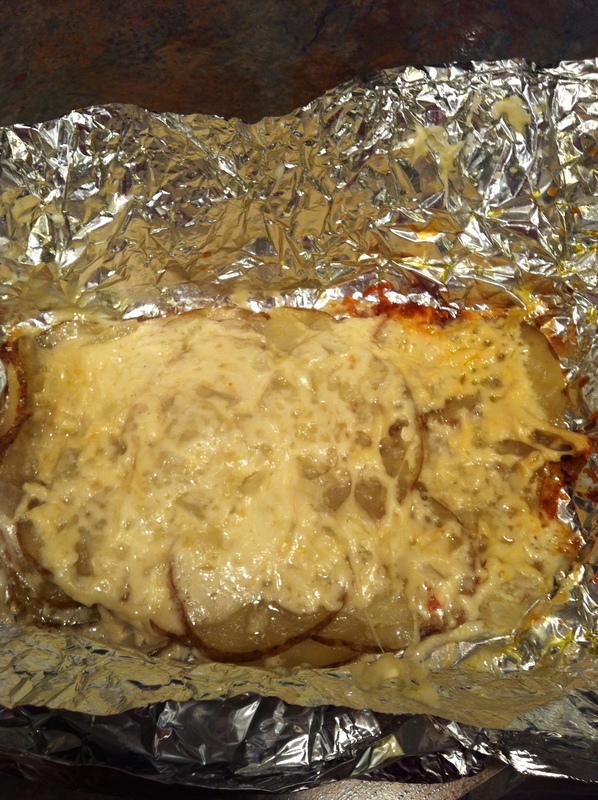 Divide the sliced potatoes evenly between the two squares of foil. Top each foil square with garlic, 2 tbsp. chopped onion, ¼ cup Gruyère cheese, salt & pepper, 2 tbsp. heavy cream and one slice of provolone. Fold the edges of the foil up around the potatoes to make a packet; making sure that nothing can spill or leak out. Place on the grill potato side down for 20-30 minutes over medium direct heat. Check that the potatoes are tender and cooked through and the cheese is melted before removing from the grill. Remove from foil and transfer to a plate. Top with parsley and serve. We’ve been doing this lately, and I love it! So easy, no mess, and very tasty. Yum! So much better than making a whole dish & putting it in the oven. Wish I had thought of it sooner! LOL!